Product prices and availability are accurate as of 2019-04-23 10:02:16 UTC and are subject to change. Any price and availability information displayed on http://www.amazon.com/ at the time of purchase will apply to the purchase of this product. 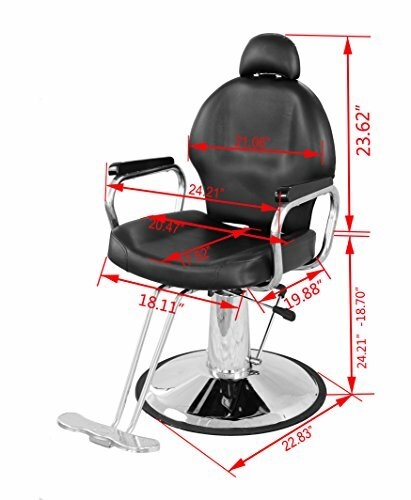 This barber chair would be a perfect addition for Barbershop, Salons, Tattoo Parlors and more. Textured synthetic leather with premium foam padding provides a comfortable place for your customer to relax. It is made from high quality materials with modern technology to ensure high quality production. Ergonomic Design--Designed to fit the natural shape of the human back, providing comfort and support to the lower back. 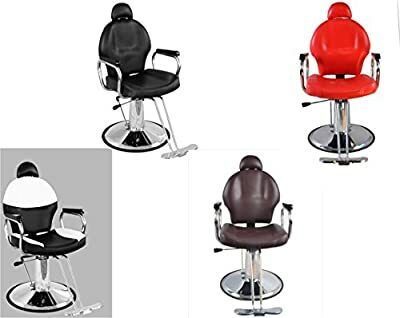 Classic and Stylish design,Long lifetime, Workmanship, Reliable quality, perfectly fit for any barbershop decor High Quality PU leather---Smooth, waterproof,durable and easy for cleaning. 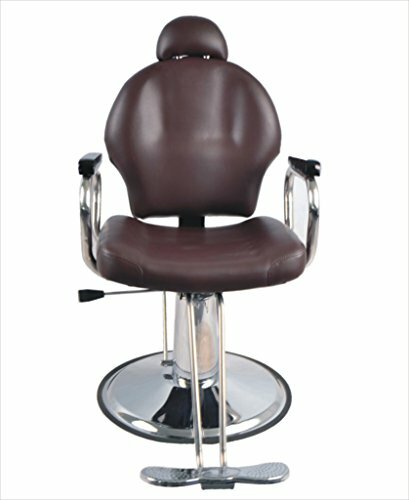 High Density Foam Seat and Backrest---provides extra comfort for your clients. Heavy Duty Steel Frame---more durable and stronger with higher capacity. Heavy-duty Hydraulic Pump---height adjustment range of 5 inches accommodates a best height fit for each individual customer. 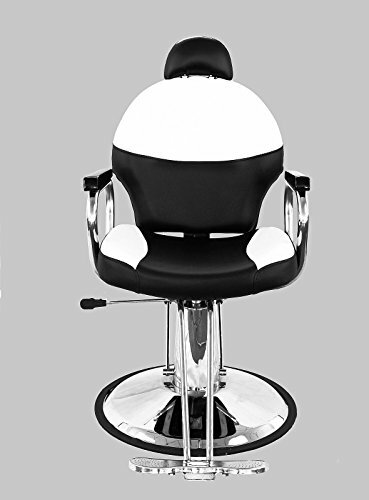 360 Degree Swivel---full swivel locking mechanism enables exact facing position for barbers. 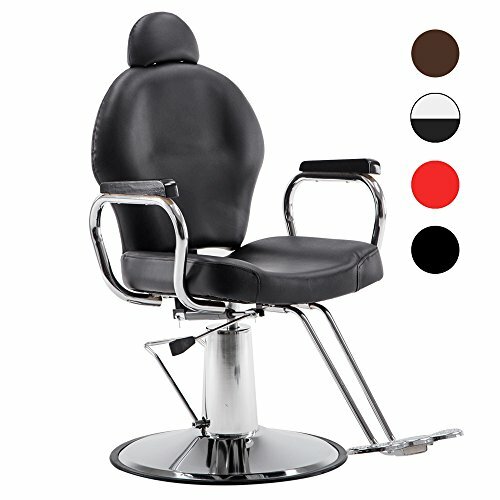 24''Round Chrome Base--- offers great stabilization of the chair while maintaining a classic appearance. Elegant T- footrest---offers extra comfort and relaxation to the clients. Color:Black,Red,Brown,Black/Creme White; Material:Steel Frame/ Synthetic Leather; Back Dimensions:21''(W)x23.6''(H); Seat Dimension:20.5''(W)x17.5''(D); Seat Height:19''-24''; Base Diameter:24''; Incline Angle:135°; Loading capacity:260 Lbs Easy to install (assembly required). 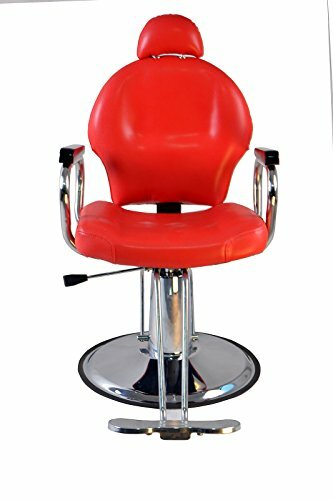 It would be one of a best fit for any beauty salon, barber shop, tattoo shop, etc.